On his third day in office, President Barack Obama proposed ways to make government more open. 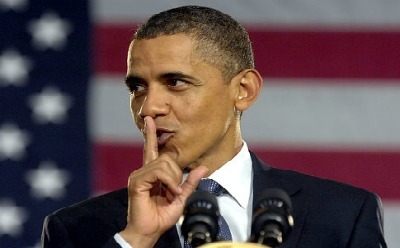 He told the press, “The way to make government accountable is to make it transparent, so people can known exactly what decisions are being made, how they’re being made, and whether their interests are being well served.” Yet the Obama administration has attempted to hide from the public eye significant information about his environmental agenda. But if there were leaks, this administration has made clear how it treats whistleblowers—that is, as criminals. Although the president once praised leaks as “acts of courage and patriotism” and “often the best source of information about waste, fraud, and abuse in government,” he has now led, as the Washington Post put it, an “unprecedented crackdown on the flow of government secrets to the media.” This unprecedented crackdown includes more indictments against whistleblowers than all previous presidents combined. On Wednesday night UK time, six detectives with the UK police (Norfolk Police Department) raided the home of at least one blogger, removing his equipment to look for clues to the identity of leaker “FOIA 2011.” On December 9, DOJ sent a preservation letter under 18 U.S.C 2703(f) to the publication platform (website host) WordPress. This authority authorizes the government to request an Internet Service Provider (ISP) to preserve all records of a specific account for 90 days while the feds work on a warrant. Norfolk PD affirmed to the subject of at least one of their raids that this international law enforcement hunt is for the leaker, meaning not for those whose acts the leaker exposed by making public emails containing admissions in their own words. The president has said, “A democracy requires accountability, and accountability requires transparency.” But if the president’s war on whistleblowers succeeds, it will end accountable, transparent government, making only government-authorized, pre-approved, self-serving information available to the public. If you are a company and a whistleblower exposes a crime, it is a criminal offense to give retribution. On the other hand, if you are the government, it is the whistleblower that has committed the crime. This is a very concerning double-standard.